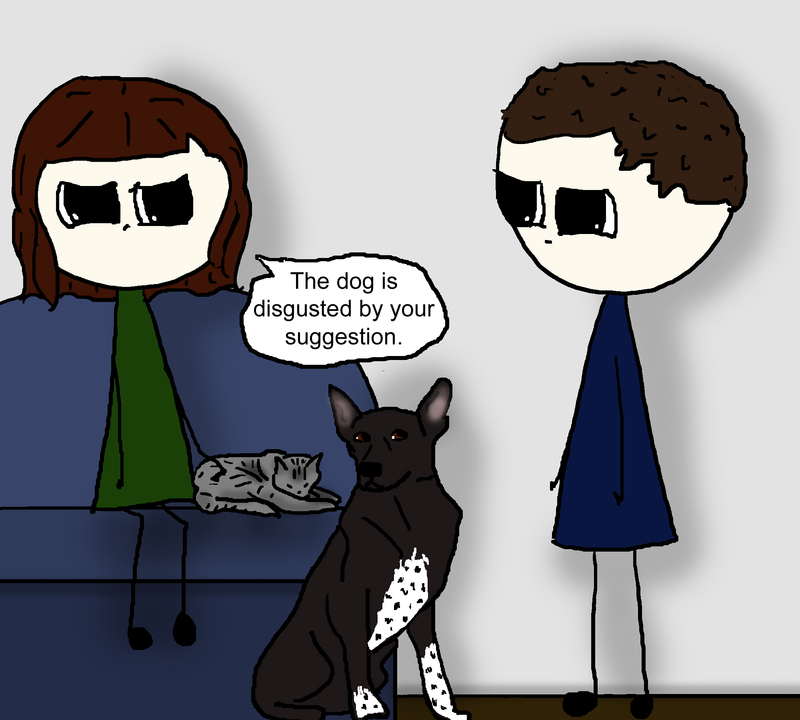 This entry was posted in Human Interactions, Marriage, Puppies and Dogs and tagged animals, cartoon, conversations, humor, marriage, pets. Bookmark the permalink. YAY! Puppy is in a comic! Dogs are so damned expressive. You like how I just made her eyes go back and forth because re-drawing her felt like too much work, haha. The cat, on the other hand, finds them all quite jejune. The cat really can’t be bothered with trivial human things. I read a study that indicated that couples who use the pet(s) to talk to each other — basically, projecting their own feelings on the pet and communicating those feelings to their partner as if they were the pet’s feelings — seem to have healthier relationships. Which I wouldn’t have guessed to be true, but apparently it helps make criticism seem less personal. This is actually a really helpful tool for people dealing with trauma. It helps them distance themselves from the trauma while still discussing it with someone. Plus, pets are (generally) a stress-reducer, so win-win in my eyes! Puppy!!!! A STAR is born! She just demanded her own strip, it’s already gone to her head. This is why I think my having to live in a no-pets building is BS. How am I supposed to have any kind of constructive conversation without a dog conduit? I was just discussing this issue with my cat. She told me to shut up and solve my own problems. Sigh. They really aren’t interested in human doings, unless it involves getting them tuna! This one caused me to do a true LOL.